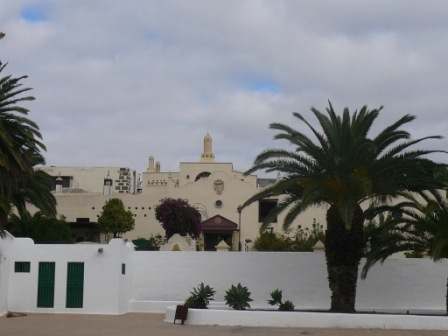 The Museo Tanit (Ethnographic Museum Tanit) in San Bartolomé, Lanzarote is fascinating! Set in the heart of San Bartolomé this traditional Canarian house dates back to 1735. The museum opened in 1999, a project completed by José Ferrer Perdomo and wife Remedios de Quintana Reyes who recently won an award on the museum’s 10th anniversary which was the Excelentes del Turismo 2010 award for the Distinguidos del Turismo in the category of Empresas Turísticas. The house has a series of rooms that hold incredible artifacts dating back over the centuries, there is so much on display you really need to take your time to look in the display cases. On arrival you will be given a guide to carry with you around the museum, this contains lots of information and a map. We explored the main house first, on the right was a display about the Guanches and pottery, to the left was a section about traditional Canarian musical instruments and songs. Here there was also a display of the traditional pottery of El Mojón, these male and female figurines with enhanced body parts were a way of proposing. The man would send the male figurine to his girlfriend and if she accepted him as a husband she would send back the figurine of the woman! There were stairs leading down from the music room to one of the five aljibes at the house, this had been converted into a small room where I envisaged the gentlemen sitting whilst enjoying a glass or two of wine. The bodega was fascinating, the smell of wine permeated the air in this room whilst the drip bowls on the floor proved there was stil Vino de Malvasía dating back over the decades, the second barrel along was from 1963. The third room off the main salon had models wearing typical Lanzarote clothing together with information on the traditional food they used to grow and farming tools. We then went up the stairs where there was a display of a typical lounge dining area with antique furniture. We went back outside and explored some of the grounds, there was a lovely shaded terrace area down some stairs leading to the garden. We went around to the left where the original wine press is situated. Next door was the camel shed which has now been converted to a tiny chapel. Further around to the left is a typical Canarian oven and set into the floor two beautiful mosaics, one depicts a bird which you are meant to touch the tail of for good luck, the other is a tree. There was another aljibe here with a spiral staircase leading down to an art gallery. We spent some time walking around, the more you look, the more you see. In the entrance area there was a fascinating agricultural calendar on the wall, farm machinery, an ornate water fountain, painted murals. The Museo Tanit is very interesting, if you want to know more about Lanzaroteños and the history of Lanzarote you should definitely include a visit to this museum. Ethnographic Museum Tanit, Calle Constitución 1, San Bartolomé, Lanzarote. Open Monday to Saturday from 10:00 – 14:00. Lovely Villa Maxim in Nazaret. In a fabulous mountainside location.